The Perth Mint has recently released the 25th Anniversary Australian Kookaburra 2015 1 oz Silver Proof High Relief Coin. The popular format features both the obverse and reverse designs of the coin rendered in stunning high relief. 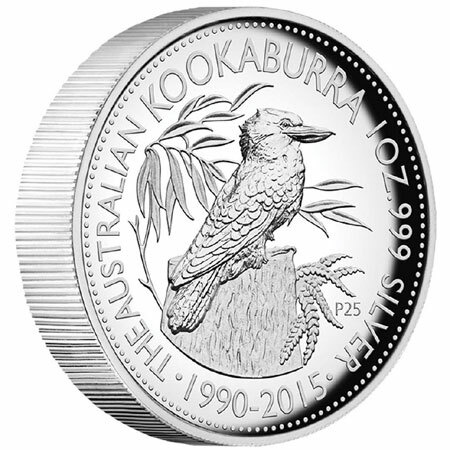 The year 2015 marks the 25th anniversary of the original Australian Kookaburra coin design which was first released in 1990. To celebrate the occasion, the original design by Dr Stuart Devlin AO CMG has been featured with anniversary dates and a special mint mark. The reverse design depicts an adult kookaburra sitting on a tree stump surrounded by eucalyptus leaves and a fern. The design include the inscriptions “The Australian Kookaburra” and the dual date “1990-2015”. The Perth Mint’s special “P25” mint mark is also incorporated. The obverse design features the Ian Rank-Broadley effigy of Queen Elizabeth II with the 2015 date and the monetary denomination. The coins are issued as legal tender under the Australian Currency Act of 1965. Each coin is struck in struck in 1 troy ounce of 99.9% pure silver and has a diameter of 32.60 mm and maximum thickness of 6.00 mm. The maximum mintage has been established at 10,000 pieces with no more than 8,000 released in individual packaging. The 25th Anniversary of the Australian Kookaburra 2015 Silver Proof High Relief Coin is packaged in a classic Perth Mint display case within an illustrated shipper, featuring the original coin design and accompanied by a numbered Certificate of Authenticity. For additional information or to place an order, please go to the recent releases section of the Perth Mint website.